In the summer of 1832, white trappers and native Americans gathered in the Teton River Valley of present-day Idaho to trade beaver pelts for supplies and fun times. These gatherings, or rendezvous, as they were known, took place from 1825-1840 in the Rocky Mountain region, and the Rendezvous of 1832 held special significance for several reasons. 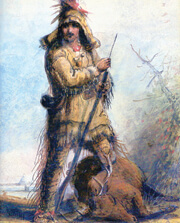 Mountain Man Old Bill Williams by Alfred Jacob Miller. The spot picked for the 1832 Rendezvous was known as Pierre’s Hole among the trappers, who dubbed large, low-laying valleys like the Teton River Valley as “holes.” Usually full of beaver and other game, they made perfect sites to locate camps and for the mountain men to hunt. Pierre’s Hole, lying just west of the Teton mountain range, was named after “le grand Pierre” Tivanitagon, a Hudson’s Bay Company trader of possible Iroquois descent who died during a skirmish with Blackfeet Indians in 1827. At the yearly rendezvous, representatives of eastern fur companies arrived with pack mules loaded with trade goods to meet the needs of the trappers for the coming year. If trappers were employed by a particular company, they turned their furs, mainly beaver, over to the company and received their pay (less the amount used to cover what they would need for another trapping season). The mountain men also purchased whiskey, tobacco, and other “luxury items” with their profits. Trappers working as free agents, not for a particular fur company, or free trappers, negotiated purchase prices for their pelts. Mountain men began to gather in Pierre’s Hole in late June in anticipation of the 1832 rendezvous, and the fur companies and traders began to trickle in by July 6 or so. The gathering proceeded well, and by July 17, the rendezvous began to break up. That’s when things began to get a little more interesting, and a lot more deadly. On that long-ago day in July, a small group of trappers led by Milton Sublette, whose brother William had supplied most of the trade goods for the Pierre’s Hole Rendezvous, set out from the gathering headed southwest for the Snake River. This party was joined by Nathaniel Wyeth, Captain Bonneville, and their small group of explorers who were headed west to Oregon and the Pacific coast. The men only trekked a few miles from the site of the rendezvous before camping for the night. When the group set out the next morning, they noticed riders on horseback approaching their party, and soon learned that these riders were Gros Ventre Indians, estimated to be between 150-300 souls between the two approaching columns. The Gros Ventres approached the white men without halting until they realized the group of white men were greater in number than they had anticipated. That slowed the approach by the Gros Ventres, which turned into an attempt, whether real or staged, at a parlay. But that parlay quickly turned into the biggest fight to take place between Native Americans and mountain men in the Rocky Mountains. The Gros Ventres, traveling with wives and children, made signs of peace towards the white men as they approached, even displaying a white flag of truce by some accounts. Two members of Sublette’s group rode out to meet the approa-ching Indians, two men who had no love for the Gros Ventre, whom they mistakenly lumped together with the Blackfeet Nation, though the two tribes were not related by blood. One was a Flathead, whose people often skirmished with the Blackfeet when they traveled east of the Continental Divide to hunt bison. The other was a half-breed named Antoine Godin, whose father had been killed by the Blackfeet. As the trappers neared the Indians, they halted, and a Gros Ventre chief dismounted and approached the two trappers bearing a peace pipe. But the two trappers had made other plans: when the chief reached the men, he extended his hand in friendship. As Godin grasped the extended hand, the Flathead Indian shot the chief, killing him. Godin grabbed the chief’s red robe as a trophy, and the two men beat a hasty retreat back to the trappers. The murder ignited an intense battle between the mountain men and the Gros Ventres. The Indians immediately moved into a nearby wood on the edge of a swamp and the women began building fortifications, digging trenches and throwing up log and branch breastworks, the men holding off the trappers while the women worked. The badly outnumbered trappers concentrated on keeping the Indians pinned down, and fortified their own positions. Milton Sublette sent men back to the rendezvous for reinforcements. As word of the fight arrived back at the rendezvous, William Sublette and his partner Robert Campbell rushed to the scene of the impending battle with more mountain men, as well as Nez Perce and Flathead Indians eager to strike a blow upon the Gros Ventres. After delivering a lively speech to enliven the men, William Sublette led an attack upon the makeshift Indian fort, while his brother attacked the rear of the fortification with another group of men. At the same time, the Nez Perce and Flathead attacked on either side of the holed-up Gros Ventres. Wyeth and his group of explorers, as well as a few other trappers, did not participate in the initial attack. The battle went on for the rest of the day, with no gain by either side. William Sublette was wounded during the initial attack. As nightfall approached, someone within the Gros Ventre fortification yelled that “many Blackfeet” were coming to join the fight. The trappers feared that the rendezvous site at Pierre’s Hole was going to be attacked, and they and their Indian allies raced back to rescue their fellow mountain men and their goods. But the Gros Ventre warning was a ruse. The rendezvous was not attacked, and when the trappers returned to the site of the battle the next morning, the Gros Ventres were nowhere to be found. At least 26 of them had died during the fight, though, including women and children. The trappers lost about a dozen men; Flathead and Nez Perce allies were among their dead. The Rendezvous of 1832 in Pierre’s Hole was the largest gathering of its kind held in the Rocky Mountains, and it resulted in the biggest fight between mountain men and Indians in the Rocky Mountains. It was also the last rendezvous where sales of beaver pelts flourished: by 1834 fashion had swung to silk hats rather than beaver, and the beaver were mostly trapped out anyway. And the western frontier was changing as well: not long after the Battle of Pierre’s Hole, on July 24, 1832, Bonneville led 110 men with 20 wagons over South Pass, the first wagons to cross that pass on the road that would become known as the Oregon Trail.